Dig deep into sales data and product information to discover trends and best-selling items with these handy Amazon product finder tools. Finding products to sell is one of the most important parts of building a successful Amazon business. This is where Amazon product research comes into play. The process involves looking for a product that’s already performing well to copy, adapt, or improve upon to reap similar – if not better – benefits. The thing is, Amazon’s website is built for shoppers, which means it shows limited information that sellers need to know. With an Amazon product finder, you can dig deep into sales data to determine which niches are trending, which products get the most monthly sales, and which listings could be improved to boost revenue. Trying to do this manually would be incredibly time-consuming. Over the past week, we’ve been researching five Amazon product finder tools, and have put together a guide highlighting their key features, how they work, and what product information they can help you uncover. What is an Amazon product finder? In this article, we have included tools that have created their own database of products available on Amazon. Effectively, they have rebuilt Amazon’s product database from a sellers point of view. This makes it possible to provide fast searching and filtering of products in a way that is not possible on the Amazon site, for example by minimum and maximum Best Seller Rank or by the number of reviews. They then provide useful data about products for sellers, including information available publicly on Amazon, but also adding in additional factors such as estimated sales. The tools covered here vary in the names they give to their product database, the number of items their databases contain, and the data points provided. But having their own independent database of Amazon products is really the key factor we are using to classify these apps as “Amazon product finders”. AmazeOwl gathers competitor insights from Amazon to bring sellers a filtered list of high-potential products. It uses a nice little five-star ranking system that gives users an instant idea of how easy it is to start selling a certain product, how high the demand is for it, and what the potential profit might be. To start using AmazeOwl, you need to download the desktop app (which is available for both Windows and Mac). This is a pretty painless process and it took me all of two minutes to sign up and get started. Inside the app, there’s a designated dashboard that lists all your saved searches, but the good stuff is accessed by clicking the “Hunt for Products” tab. From there, you can choose which Amazon site you want to search for products on and then either run a product keyword search, find Amazon’s current bestsellers, or dig even deeper with the built in product database that lets you get really targeted with your searches. Running a keyword search gives you an insight into what products are performing well in specific niches, while the “hunt bestsellers” option provides inspiration for sellers who are still deciding on their niche. Both options take you straight to Amazon so the interface looks just like it would for a buyer – except for the insightful floating card. This feature appears at the top of the screen and highlights how many “high-potential” products there are on a page based on the specific search terms you entered. 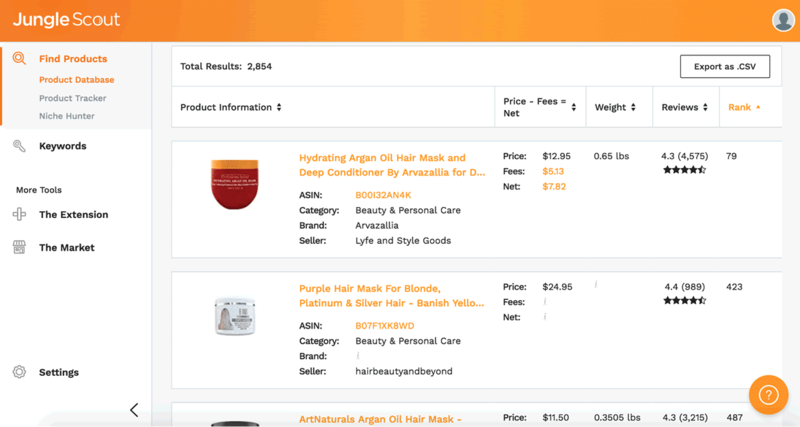 Here, you can see that there are four “high-potential” products on this page of hair masks, and the Briogeo conditioning mask is one of them, with a Best Seller Rank (BSR) of 2025 in Beauty & Personal Care. When you’ve found a product you’re interested in, you can save it to your dashboard where you can then add notes and pull together a catalog of potential high-earning products. How much does AmazeOwl cost? You can sign up for a 10-day free trial that lets you monitor one niche and search for three keywords. Users can only access the product database with a paid subscription, not under the free trial. Prices then start at $14.95 a month for 10 niches, 10 keyword searches, and 50 products in the product database, and go up to $29.95 a month for 300 niches, 50 keyword searches, and 200 products in the database. AMZ.One touts itself as having “the best tools for Amazon in one place”. And, at first glance, it does seem to have a lot of different in built tools and features which can be overwhelming at first. But, when you log in (which is a simple form situation rather than downloading an app like AmazeOwl), you’re taken straight to a personalized dashboard that has all of the tools listed out down the side. This makes it easier to navigate and separate each area out, so it kind of is like using a number of tools in one. 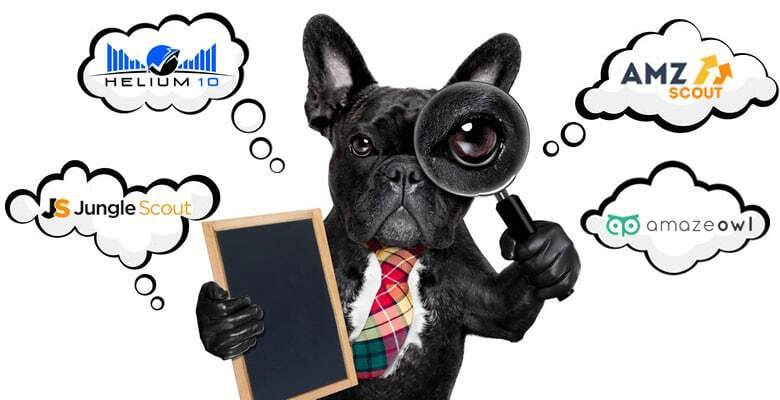 The three top functions are Keyword Rank Tracking, Best Sellers, and Sales Tracking. Best Sellers is the Amazon product finder within AMZ.One, covering the top 30,000 best selling products in each category, rather than the many millions found in other tools. Best Sellers includes an arbitrage feature to help sellers find products that are available at a lower price from hundreds of different stores (with the option to select specific stores), should they wish to concentrate on arbitrage instead of private labeling. You can then grab the ASIN of the product and add it to your dashboard to monitor its keyword rank, sales ranking, and any negative reviews. How much does AMZ.One cost? You can test the tool out for free with keyword search and sales tracking for one product, but you can’t search the Best Sellers product database on the free plan. Alternatively, you can get a free seven-day trial that then leads into a paid subscriptions. The subscriptions start at $20 a month for 45 keywords and 20 sales tracking items, and go up to $180 a month for 1,500 keywords and 200 sales tracking items. The login process for the AMZScout web app is by far the easiest out of all these Amazon product finder tools. It really is just a click-and-go deal and there’s no need to type in any details at all. Once you’re inside, the dashboard looks a little sparse to begin with, but that’s easily rectified once you start using the three main tools: Keyword Explorer, Product Database, and Product Tracker. On the homepage, AMZScout shouts from the rooftops that it has more than two million products in its database, all of which can be quickly analyzed and measured based on their BSR, profit revenue, and sales history. 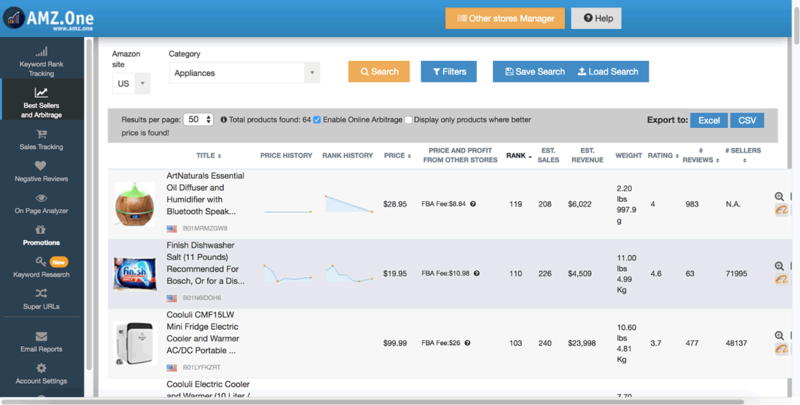 The product database lets you plug in specific keywords or search for the best-ranking products in a certain category. From there, you can get an instant overview of a product, including its current rank and rank history in the specified category and its current price and price history. There’s also a profit calculator (this is actually a pretty neat feature) that lets you see how much it costs to sell the product, how much revenue you can make, and the profit margins. Once you’ve identified a product that you’re interested in, it’s a one-click process to add it to your Product Tracker. From there, you can monitor your chosen products daily, including the estimate sales volume and its Best Seller Rank. How much does AMZScout cost? You can try out the tool for free, with limitations. You can access the product database, but you can’t dig any deeper than the current price and how much revenue the product generates each month. AMZScout is clearly pushing hard for users to sign up for annual or lifetime subscriptions, with paid subscriptions starting at $44.99 a month but it’s only $99 for an annual subscription. Alternatively, you can get AMZScout for life for $199. 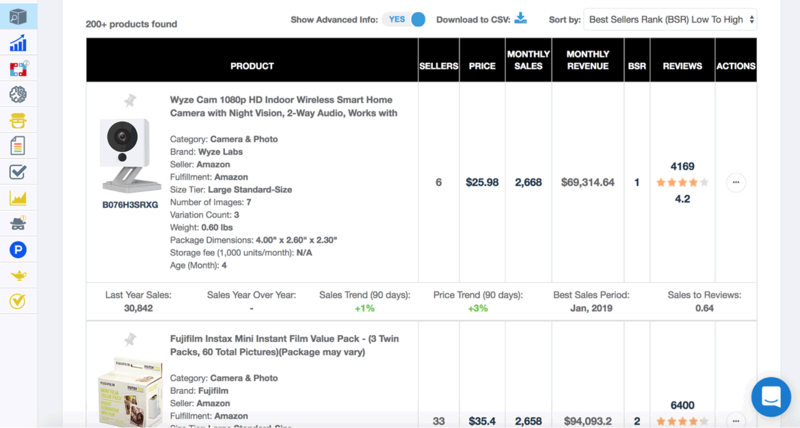 Helium 10 offers a suite of Amazon seller tools including Black Box, which focuses solely on finding and analyzing products. To access it, you have to sign up to the Helium 10 range of tools (which could be a good thing if you’re looking to have numerous tools in one place) and then navigate to the Black Box section, which can be a little confusing if you’re using it for the first time. Once you get into the dashboard though, the interface is really simple and sleek. In the basic search section, you can choose to search via category, competitors, or niche, and then use the filters to hone down onto products that match your price range and revenue targets. The advanced search options are pretty neat, as they let you narrow down your searches to include products that have had a minimum number of sales throughout the year, or a certain number of images or existing sellers. When you hit the search button, you’re served with a list of products that match your criteria, which you can then rank based on different attributes (like BSR, price, or number of sellers). Each listing has its own little snapshot that includes information about its current price, the number of monthly sales it gets, how many sellers it has, its BSR in your chosen category, the number of reviews, and its average star rating. Extra information that some of the other tools don’t have includes the best sales period for each particular product and the sales-to-reviews ratio. When you’ve found a product that’s piqued your interest, simply click the “Add to List” option, which then files it under “My List” in the main dashboard. From there, you can keep an eye on how the product is doing from month to month. You can sign up for the free plan which gives you 20 free uses. From there, you can sign up to Black Box on its own for $37 a month, or sign up for the whole Helium 10 suite for $97 a month. The web app version of Jungle Scout is an Amazon product finder helping sellers find product ideas based on supply and demand. Unlike the other tools listed here, there isn’t a free trial so you have to dive straight in at the deep end and sign up to one of the paid subscriptions. Inside the dashboard, there’s plenty to keep you busy. 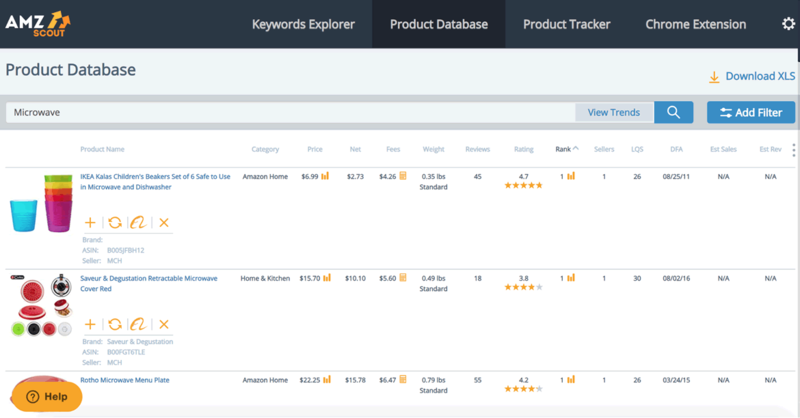 You can run searches by category and keyword, and plug in advanced filter options like the maximum number of sellers, the minimum monthly sales, and a minimum star rating. When you hit the search button, you’re served up a list of the most relevant products. From there, you can see what keywords the products are ranking for by clicking on the ASIN number, check out the average number of monthly sales and get a monthly revenue estimate. There is a clever feature that lets you create groups of items in your dashboard. You can then add different products from different niches into their own group to monitor what’s doing well. The tool also collects data on current trending items within your chosen niche so you can discover hot new products as they’re on the rise. As well as a web app version, Jungle Scout has a Chrome Extension option that provides instant product insights, like sales estimates and real-time profit projections as you’re browsing the pages of Amazon. How much does Jungle Scout cost? Prices start at $39 per month for one user and tracking for 40 products and go up to $99 per month for six users and tracking for 150 products. All plans include the product database, but the Niche Hunter tool is only available on the Standard plan at $69 per month, and above. Carrying out the research has shown us that using an Amazon product finder tool is a really quick and simple way to find best-selling products and trending niches. Apart from Jungle Scout, the options here all offer a free version or a free trial, which means you can test them out to suit your individual needs. It’s worth noting that, as with anything in the fast-paced online world, things can change practically overnight. A product that might have been trending for one season might have abysmal sales the next, and it’s best to not rely solely on the data from one tool to fuel your entire business model. Just because a product has sold really well for one business, it might not mean the same for you. That being said, a product finder tool can be a great way to open yourself up to new product ideas and to get inspiration for your next line of goods. The final caveat is that these aren’t the only product finder tools out there. In fact, there are many other market research tools in the Web Retailer directory, covering Amazon, eBay and other marketplaces, and a range of different approaches for finding and analyzing products. You might find one that’s not on this list works best for you and your business, and that’s the beauty of selling online. Are you using an Amazon product finder? If so, share your experience with us in the comments below. Thanks for the detailed study. There are multiple tools like SellerApp, Viral Launch, AmzScout not listed here. Note that not all the market research tools in the directory have their own product database like these ones.